I nosed out into traffic late on Friday, having lost my keys, then decided that it would help my cause to get an oil change, then argued with Jiffy Lube about all the extras they were trying to charge me for, then discovered one of my clients had changed their bank, which led me to PNC “Charge a fee” Bank to cash a check, and then on the road. Expected departure time was 10 AM, real time closer to 11. 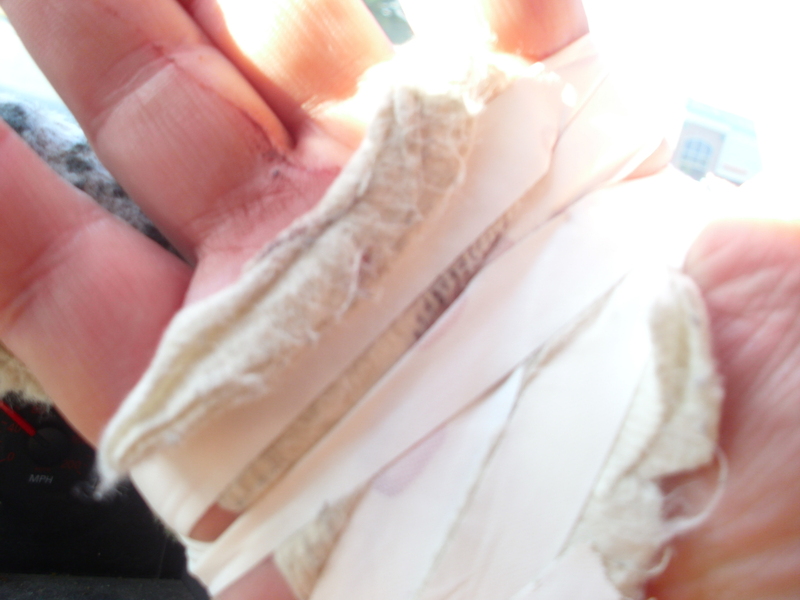 Did I also mention that I had sliced my right hand open at the palm, making a big icky mess to contend with ? I don’t want to talk about it,.. damned carnies.. it’s painful. Got to Lancaster Host by taking the Western Route (Route 15 at Leesburg north at Point of Rocks, MD). 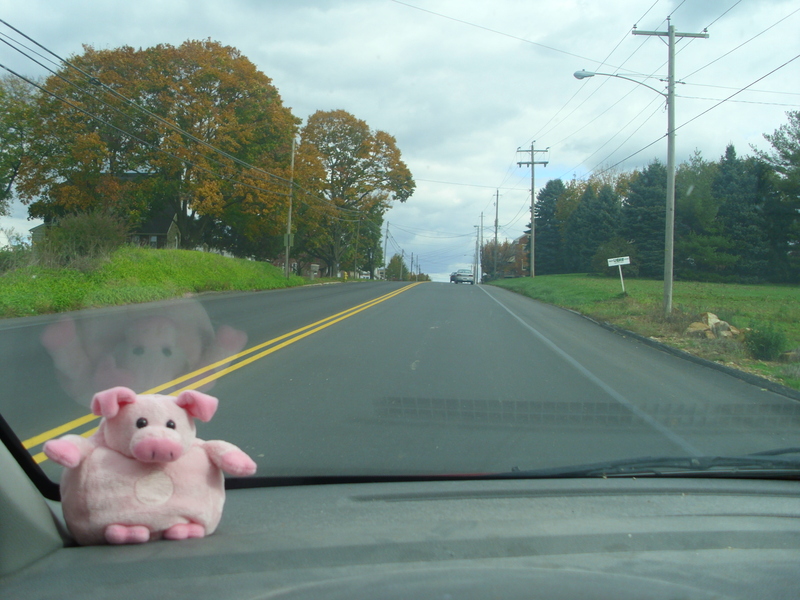 This was a new approach for me (Route 7 to Route 15 all the way to Gettysburg, then to Lancaster on 30). I’m not sure I saved a lot of time, honestly, but it was prettier than driving up 270 or all the way up to Baltimore to take a left at route 83. Sing, it, Bing! "We're off..on..the Road to.. Lancaster!" After all these stressors, I required some fun.. and got it by visiting the Flea Market where I met up with Chort (John Montrie) and his coterie. Chort is an old friend from the Markland era and a dab hand at painting. He painted my Blood Angels for my Space Hulk set. Since John has retired, he has more time to paint, and since my eyes aren’t getting any better with age, I’m inclined to give him a commission or two. He painted up my Renaissance Leonardo Infantry which will likely be used for HOTT. I also found some lovely 15mm Renn stuff for sale and bought some command figures for my army.. pictures will be forthcoming. I’m very pleased with John’s work, and gave him some new projects to help me with– one of which is to paint the Tyranids from the Space Hulk game! Gulped down a quick meal at nearby Fuddruckers, the only place to get ostrich meat nearby, and brother, was I craving ostrich for some reason. Having my perverse appetite slacked for once, I went back to get involved in Steve Gibson’s Zombie game. This is a version of our TNGG group’s highly entertaining Halloween game which I had missed the night before. Alas, it was full of people with legitimate tickets, so I helped set up for a while. I was intrigued by the Russo Japanese fleet game of Tsushima setting up next to me, so I wandered over to join in. This was Brian DeWitt’s house rules, WHEN DREADNOUGHTS RULED THE SEA. 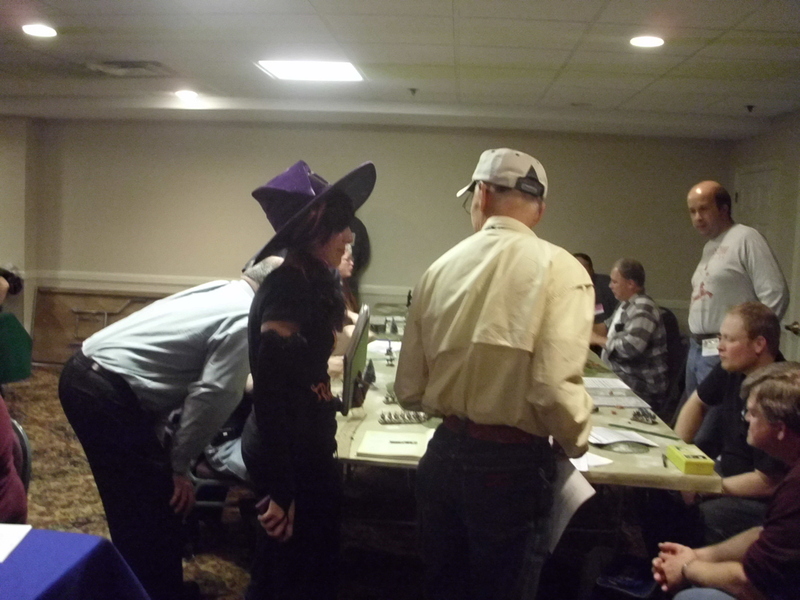 I had played the Yellow Sea scenario at HISTORICON this year and enjoyed them. In that scenario, I was a line of light Japanese destroyers and light cruisers facing an oncoming Russian line. In this game, I took the underdogs, the Russian fleet at TSUSHIMA. This was a fantastic game for everyone, and very, very close. The end was a draw (sort of, leaning toward a Russian Victory at 41 to 39). High points were us destroying the Japanese flagship MIKASA and ADZUME, plus a host of smaller vessels, destroyers and almost all of their older cruisers. They delivered some serious damage to the line I was commanding which had the “honor” of shielding most of the Russian fleet. We called it about 10PM, when it was obvious that we would probably be able to fulfill the main victory condition of exiting some of the Russian fleet from the far edge of the table. A very different outcome from history actually. There were some good games being run Friday, but I didn’t see much beyond the Marrieta Room. 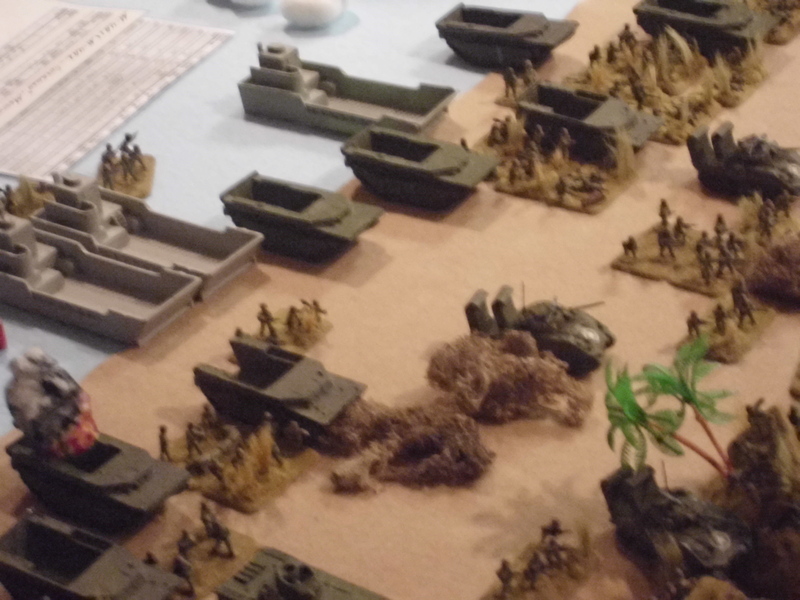 Mike Betts' anonymous stepping stone to victory game, Pacific theater. After the game, we cleaned up Brian’s pre-dreadnoughts and I headed up to the bar for a pleasant chat with Howard Whitehouse, Lindsey Gauld and Tony Reidy. I was wavering on the brink of having a beer, but decided the smart move would be to figure out where my hotel was that night. Sure enough, I found the knuckleheads I was sharing a room with down in the open gaming area. 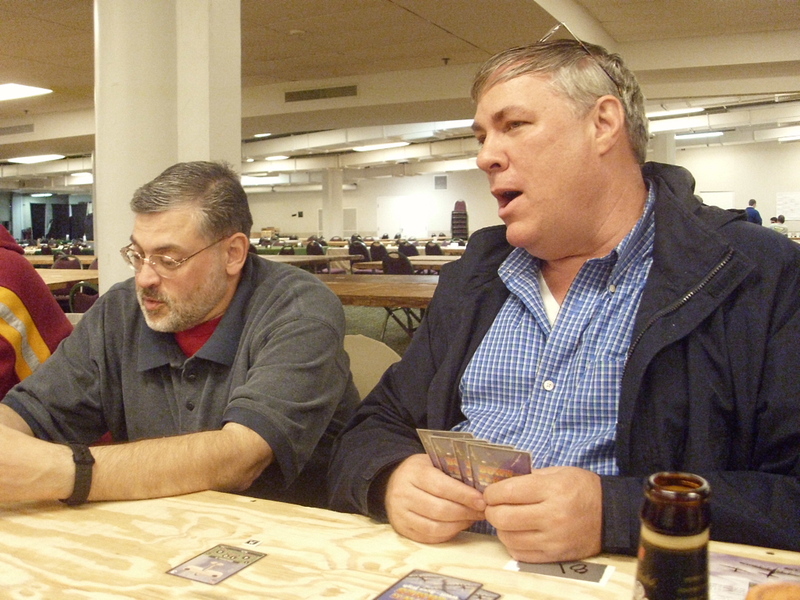 They were playing the new, DVG version of Down in Flames, one of my favroite GMT games ever. So I sat in on a game. Great fun, a lot different from the GMT version. And thence we stumbled to our beds! While basic, I really like Walt’s rules and use them with WWI 1/2400 scale miniatures at home. I had to leave the con today so I look forward to hearing how Saturday and Sunday go.